The lone man killed in the Oregon standoff is remembered as a quiet person who "had to stand by the Constitution." Trent Nelson | The Salt Lake Tribune Arianna Brown, daughter of Robert "LaVoy" Finicum, speaks about her father before his funeral in Kanab, Friday February 5, 2016. Finicum was shot and killed by police during a January 26 traffic stop. Finicum was part of the armed occupation of an Oregon wildlife refuge. 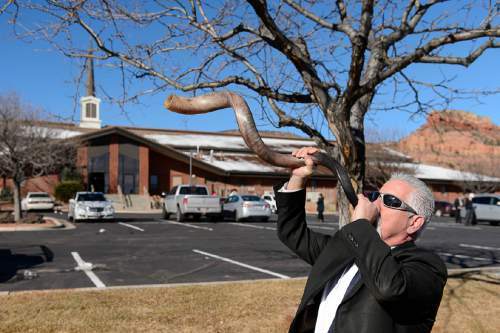 Trent Nelson | The Salt Lake Tribune Brand Thornton blows a shofar before the funeral for Robert "LaVoy" Finicum, in Kanab, Friday February 5, 2016. Finicum was shot and killed by police during a January 26 traffic stop. Finicum was part of the armed occupation of an Oregon wildlife refuge. 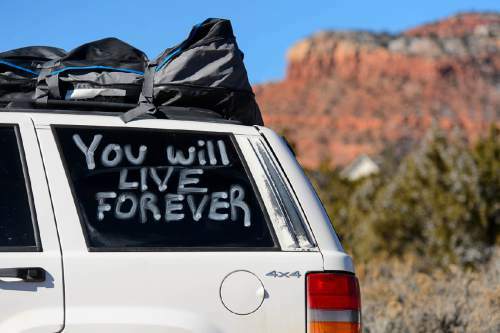 Trent Nelson | The Salt Lake Tribune "You Will Live Forever", written on a vehicle at the funeral for Robert "LaVoy" Finicum, in Kanab, Friday February 5, 2016. Finicum was shot and killed by police during a January 26 traffic stop. Finicum was part of the armed occupation of an Oregon wildlife refuge. 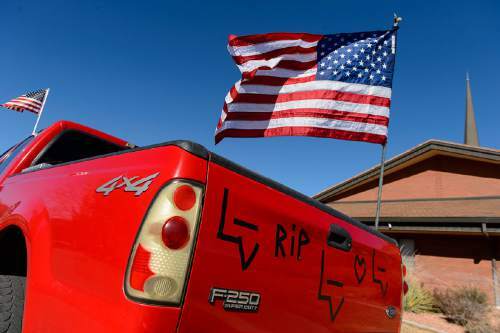 Trent Nelson | The Salt Lake Tribune Flags and tape on a 4x4 truck at the funeral for Robert "LaVoy" Finicum, in Kanab, Friday February 5, 2016. Finicum was shot and killed by police during a January 26 traffic stop. Finicum was part of the armed occupation of an Oregon wildlife refuge. 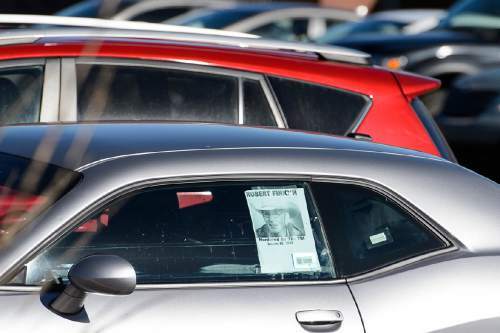 Trent Nelson | The Salt Lake Tribune A sign in a car window reads "Murdered by the FBI" at the funeral for Robert "LaVoy" Finicum, in Kanab, Friday February 5, 2016. Finicum was shot and killed by police during a January 26 traffic stop. Finicum was part of the armed occupation of an Oregon wildlife refuge. 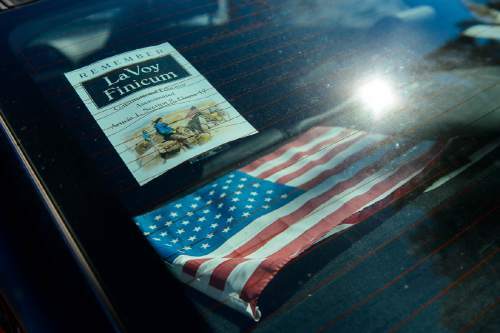 Trent Nelson | The Salt Lake Tribune A flyer in the rear window of a car at the funeral for Robert "LaVoy" Finicum, in Kanab, Friday February 5, 2016. Finicum was shot and killed by police during a January 26 traffic stop. Finicum was part of the armed occupation of an Oregon wildlife refuge. 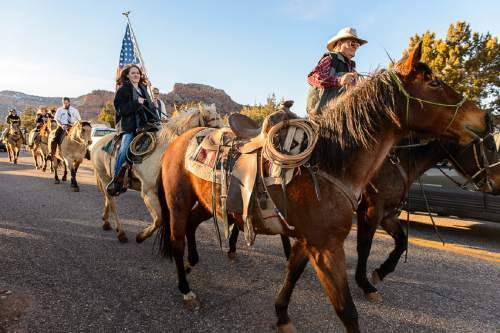 Trent Nelson | The Salt Lake Tribune Riders on horseback ride in a procession following the funeral for Robert "LaVoy" Finicum, in Kanab, Friday February 5, 2016. Finicum was shot and killed by police during a January 26 traffic stop. Finicum was part of the armed occupation of an Oregon wildlife refuge. 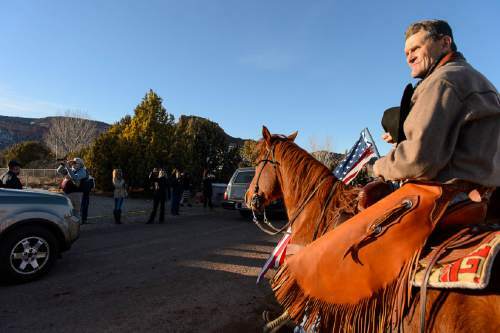 Trent Nelson | The Salt Lake Tribune A riderless horse leads a procession following the funeral for Robert "LaVoy" Finicum, in Kanab, Friday February 5, 2016. Finicum was shot and killed by police during a January 26 traffic stop. Finicum was part of the armed occupation of an Oregon wildlife refuge. Trent Nelson | The Salt Lake Tribune A procession of pedestrians and riders, following the funeral for Robert "LaVoy" Finicum, in Kanab, Friday February 5, 2016. Finicum was shot and killed by police during a January 26 traffic stop. Finicum was part of the armed occupation of an Oregon wildlife refuge. Trent Nelson | The Salt Lake Tribune The procession after the funeral for Robert "LaVoy" Finicum, in Kanab, Friday February 5, 2016. Finicum was shot and killed by police during a January 26 traffic stop. Finicum was part of the armed occupation of an Oregon wildlife refuge. 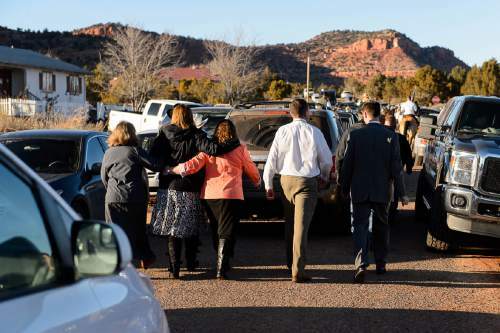 Trent Nelson | The Salt Lake Tribune The procession after the funeral for Robert "LaVoy" Finicum, in Kanab, Friday February 5, 2016. Finicum was shot and killed by police during a January 26 traffic stop. Finicum was part of the armed occupation of an Oregon wildlife refuge. 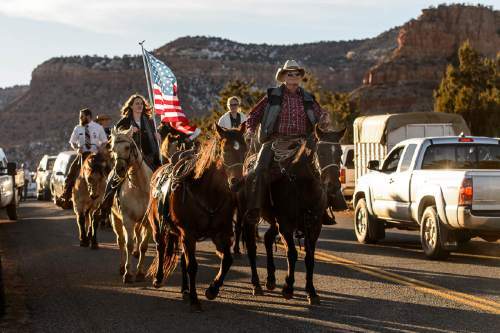 Trent Nelson | The Salt Lake Tribune A riderless horse leads a procession following the funeral for Robert "LaVoy" Finicum, in Kanab, Friday February 5, 2016. Finicum was shot and killed by police during a January 26 traffic stop. Finicum was part of the armed occupation of an Oregon wildlife refuge. Trent Nelson | The Salt Lake Tribune Security working for the family stand at the entrance to the parking lot at the funeral for Robert "LaVoy" Finicum, in Kanab, Friday February 5, 2016. Finicum was shot and killed by police during a January 26 traffic stop. Finicum was part of the armed occupation of an Oregon wildlife refuge. 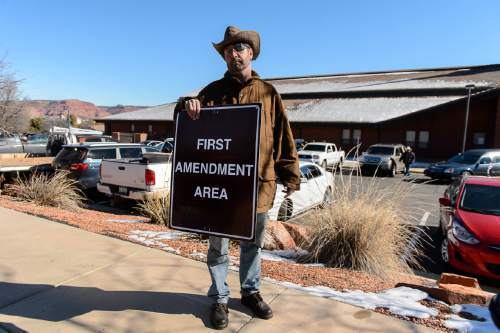 Trent Nelson | The Salt Lake Tribune Greg Whalen holds a "First Amendment Area" sign he says came from the Bundy ranch in Nevada, at the funeral for Robert "LaVoy" Finicum, in Kanab, Friday February 5, 2016. Finicum was shot and killed by police during a January 26 traffic stop. Finicum was part of the armed occupation of an Oregon wildlife refuge. 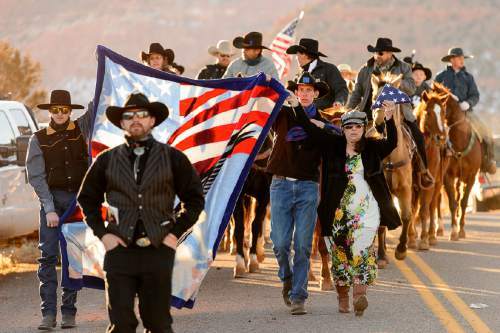 Trent Nelson | The Salt Lake Tribune The procession after the funeral for Robert "LaVoy" Finicum, in Kanab, Friday February 5, 2016. Finicum was shot and killed by police during a January 26 traffic stop. Finicum was part of the armed occupation of an Oregon wildlife refuge. Kanab • Robert "LaVoy" Finicum was a quiet, soft-spoken man whose ideal funeral might have been a small gathering of family. This, according to his daughter Arianna Brown, cornered by a phalanx of cameras as she dug her black heels into the roadside mud. Across the street, armed men patrolled the entrances of the church parking lot. As Brown spoke of her sorrow, a nearby man put in, "This is what the federal government does." 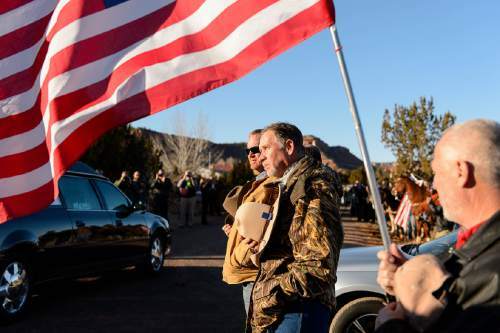 About 700 people  Nevada rancher and land-rights figurehead Cliven Bundy among them  visited a Kanab LDS stake center to pay respects to Finicum and his family Friday. Finicum was killed by law enforcement a day shy of his 55th birthday after three weeks occupying an eastern Oregon federal wildlife refuge. Some knew Finicum only vaguely as a resident of Fredonia, Ariz., one of the small communities that dot the vast, arid region. Some had never met him, familiar with Finicum as the de facto spokesman for a small group of activists who say the federal government&apos;s ownership of Western lands violates their constitutional rights. Floyd Farnsley, a retired letter carrier who drove up with a friend from Peoria, Ariz., said he could explain his presence in one word. Brown, a 26-year-old who lives in Glendale, Ariz., remembered her father for the family board games he would play until late in the night, and for never missing his children&apos;s basketball games, even if he might bring a book about the Founding Fathers. But Finicum will be more broadly remembered for his role in the occupation of the Malheur National Wildlife Refuge and his death, filmed by an FBI plane: Finicum, having veered into a snowbank to avoid a roadblock and narrowly missing a law enforcement officer, running through the snow with his hands at first held up, then appearing twice to reach toward what the FBI would later say was a 9 mm handgun. He was shot an unknown number of times and killed. Few Friday described his death as anything but murder. A horsetop Bundy, before joining a memorial ride in Finicum&apos;s honor, said he was "basically crucified." Eldest daughters Thara Tenney and Belle Collier said their father had been marked as an extremist in the tradition of great reformers like Joan of Arc and Thomas Jefferson. Nearby, men displaying the insignias of the Three Percenter and Oath Keeper militias filled the daughters&apos; pauses with gravelly interjections of "Hear, hear." The family has paid for an independent autopsy and planned to announce the results another day, according to its spokesman. The service itself did not often touch on whether Finicum&apos;s shooting was justified, or on the land-rights movement. Finicum was described as a tireless, faithful man with a glint in his eye and a fondness for pranks. A prolific singer of questionable pitch. A man who was a hero to his 11 children and his younger siblings  whose embrace they could count upon at any hour, and who yet had nobody to hold onto as he died in the snow along a desolate stretch of Highway 395. Kanosh attorney Todd Macfarlane said it&apos;s strange, given that Finicum is said to have gone to Oregon without a change of clothes, that the diminutive rancher would be the one to meet a tragic end as six others were arrested on Jan. 26 after three weeks of occupation. Macfarlane had been asked by Finicum&apos;s brother, Guy Finicum, to help Finicum tweak the message that was emerging from the refuge  namely that Finicum was prepared to die, and that he&apos;d rather die, in fact, than spend his days in a "concrete box." Finicum had gained notoriety as "Tarp Man," spending the night beneath a blue tarp in case the federal government showed up. He was ready, apparently, to ward them off. His family "felt like he was completely misportrayed and mischaracterized," Macfarlane said. Kenneth Rhoades, of McComb Township, Mich., said he regularly visited the refuge with indicted right-wing media personality Pete Santilli. Rhoades said that the night Finicum slept out in the snow, he was warmed only by a small propane heater. Rhoades begged Finicum to spend a minute or two in their idling vehicles, but Finicum declined on principle. "I said before they even killed him, anybody should walk 10 miles to shake his hand," he said. Finicum&apos;s first involvement in the land-rights movement came when he was one of the first to arrive at a 2014 standoff between the federal government and Cliven Bundy, who long refused to pay grazing fees. Bundy said that at the time, Finicum was "with lots of cowboys, and he was just one of them." But Finicum "paid attention to what we were fighting for," Bundy said, "and he went home and canceled his grazing permit." Brown said that was a tough decision for her father. He didn&apos;t feel oppressed. He felt the Bureau of Land Management had been fair to him. "But he said, should they have the power to do good, they have the power to do bad, and he had to stand by the Constitution," she said. "And when he heard about the Hammonds, his heart just broke." Finicum flew to Oregon to attend the early January rally for Dwight and Steven Hammond, who were ordered to return to prison for fires set on federal land. There, in a protest at a grocery-store parking lot, Rhoades said, a handful of men started spreading the word to follow them in their truck. "History&apos;s being made," Rhoades said they told them. Finicum was apparently among those to heed the call. Bundy, whose sons Ammon and Ryan Bundy are thought to be among the organizers of the takeover, said Finicum had a unique ability to "express himself without any kind of anger," and his comfort as a public speaker would make him the most conspicuous of the refuge&apos;s occupants. Macfarlane said by phone Thursday night that he wished authorities had been more patient, the media more discerning. "If everybody had just ignored it, it would have just shriveled up and died and gone away in not all that long of a time," he said. On Friday, Finicum&apos;s death served as a rallying point for organizations sympathetic to the land-rights cause. Father and son Brand and Nickaoli Thornton, of Dillon, Mont., blew into shofars to sound not a somber note, but one they said would call upon God to protect them in a coming battle. Men with visible firearms manned the entries to the church&apos;s parking lot to vet incoming vehicles. They declined to share their names or the organizations they were affiliated with. It is against The Church of Jesus Christ of Latter-day Saints&apos; policy to carry firearms on church property. Victoria Sharp, an 18-year-old who sat in the backseat of Finicum&apos;s truck at the time of his shooting but was not arrested, was scheduled to sing in a benefit concert after the funeral. 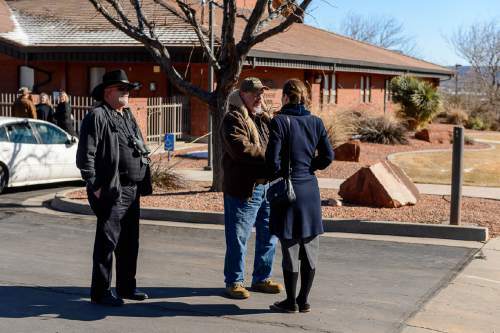 Earlier in the day, the Sharp family gave a preview to patrons of Kanab&apos;s Holiday Inn Express, harmonizing as people walked by with plates of biscuits and gravy. "We&apos;re speaking for LaVoy Finicum," said Sharp&apos;s mother, Odalis Sharp. 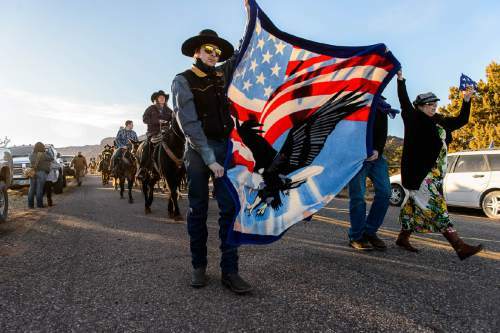 The Oregonian on Friday reported Kanab&apos;s Shawna Cox, who was in Finicum&apos;s truck and was indicted for her role in the occupation, was allowed to attend the funeral after filing a last-ditch emergency motion in U.S. District Court.